Leather-look with faux reptile trim. 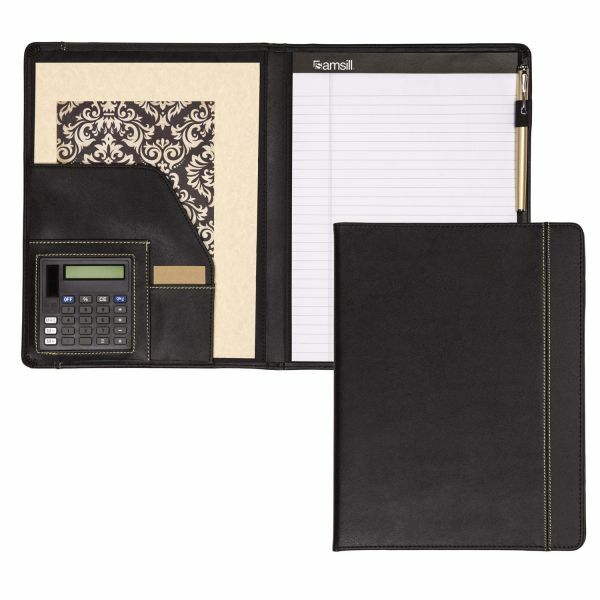 Features writing pad, dual powered calculator, pen loop, inside storage pockets for documents and business cards. 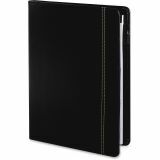 Samsill Slimline Padfolio, Leather-Look/Faux Reptile Trim, Writing Pad, Black - Smart, slim and stylish. When you step out for an interview or a business meeting, everything you carry should be organized and look as professional as you do. Our versatile Slimline Padfolio is smartly designed for an absolute professional appearance without compromising on functionality and convenience. This professional business portfolio features a classic minimalist design that boasts a simple yet stylish look and feel of fine black Napa leather. The exterior cover is accented with contrasting stitching and stylish faux reptile leather accent trim to give a unique look. 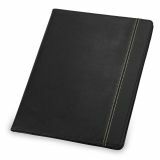 Designed for use by men and women, this black leather-look business padfolio is destined to become your daytime essential while making your great first impression, everywhere you go! Get organized, stay organized. The Slimline padfolio book-style padfolio opens to reveal multiple storage pockets to keep your files, papers, and other necessary items safely at your disposal. It also includes smaller pockets to carry your business or credits cards along. It also includes a pen loop so you are always prepared for writing down important notes. 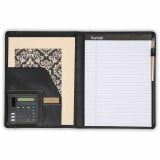 One of the defining features of this business padfolio is the built-in calculator with raised keys for added convenience. The calculator runs on both batteries and solar energy. 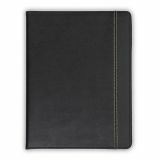 This work padfolio comes equipped with a handy 8.5" X 11" writing pad to provide note-making or writing space during business meetings or interviews.